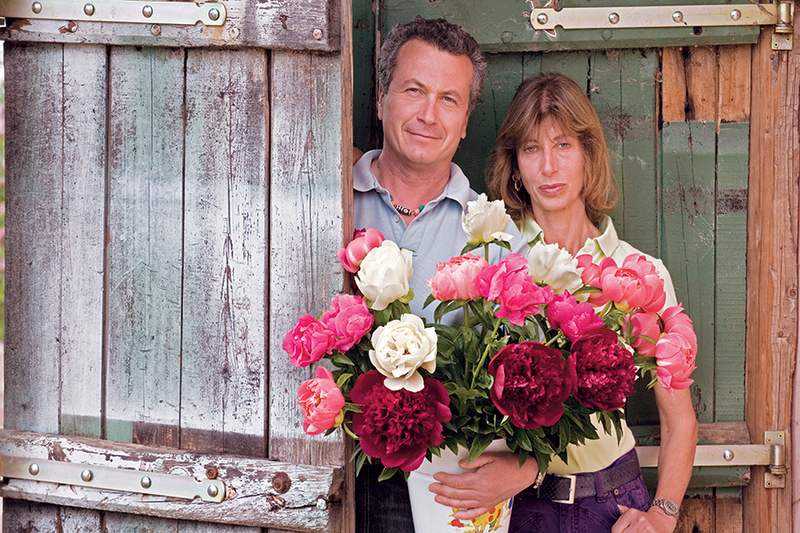 The best period to plant peonies, both bare root and in vase, goes from September to the last days of November. By planting them in autumn peonies are allowed to develop and branch their roots before the beginning of vegetative resumption. It is possible to plant them in winter, as long as the soil is not frozen during the day. After March it is possible to bed peonies, as long as they are cultivated in vase. 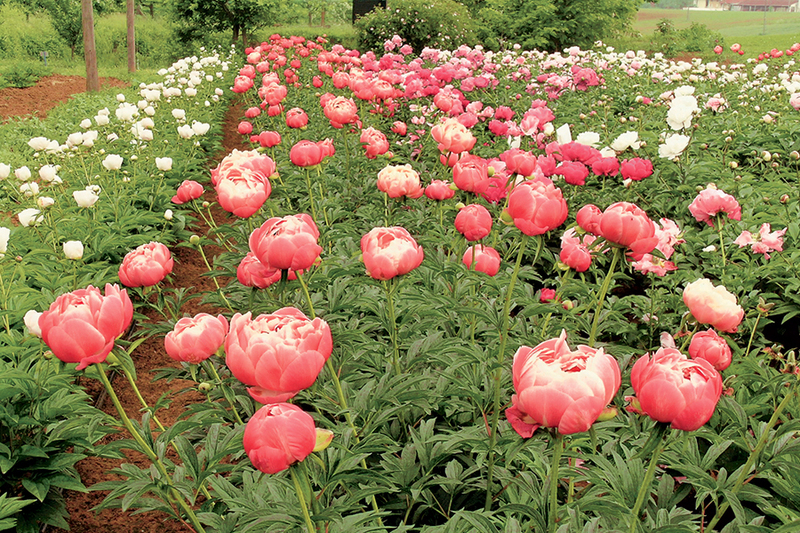 The ideal soil for peonies is rather clayey, humus-rich, deep, permeable and well drained. The optimal pH can vary from sub-acid to slightly alkaline (6.5-7). It is important, before planting, to break up the soil, possibly to mix it with sand and peat and to enrich it with organic manure (aged manure, good vegetable compost, bone-meal); however, direct contact between roots and fertilizers should be avoided. Water stagnation should be avoided as much as possible: when the soil is especially humid it is useful to put in the bottom of the planting hole a 5-10 cm layer of gravel or other coarse material. Peonies like sunny places but, depending on the region, can also be planted in partial shade. Experience teaches us that tree peonies, while very enduring, are more suited to partial shading: plants which are partially shaded, especially early in the morning, keep their leaves green longer and usually have fewer problems with leaf diseases compared to those kept in full sunlight. Herbaceous peonies, instead, like full sunlight much better, and when shaded too much might not bloom at all. All peonies need space and should not be placed too close to the roots of other plants; should it be necessary to plant them near trees or strong plants, particular attention should be paid to provide them with manure when planting and regularly afterwards. Tree peonies grow slowly but can attain a size of two meters both in diameter and height; it is thus necessary to plant them at a distance of at least 1.3 meters from other plants. Herbaceous peonies grow only in diameter, while keeping a constant height characteristic of the species or variety, ranging from 40 cm for some botanical species to 1 meter or more for some hybrids. Herbaceous peonies should have at least 80 cm of free space around them. If peonies are used to make flowerbeds or hedges, a space of 80-90 cm should be left between the plants for herbaceous peonies, and 130-160 cm for tree peonies. It is never advisable to plant them in hollow areas where rainwater accumulates. Make a trench 40 cm wide and 40 cm deep, mix well the dug soil with manure and possibly with amenders, put drainage at the bottom of the hole if necessary, and bury the plant completely, making sure the buds are not deeper than 3-4 cm. Make a trenching 40 cm wide and 40 cm deep, mix well the dug soil with manure and possibly with amenders, put drainage at the bottom of the hole if necessary, put the plant in the hole in such a way as to place the grafting point (recognizable from a sudden increase in diameter of the trunk) 8 to 10 cm underground; cover taking care not to break any secondary roots. After a few years it is good practice to prop up the plant 7-8 cm by making a soil mound around its base. It is advisable to protect young plants with some sticks driven into the soil to make a pyramid, to avoid stepping on them. Peonies are not among the most suitable species for potting. They are plants with a rather extensive rootage, and in pots their roots tend to fill up all the available space. That is why herbaceous peonies especially cease to flower after a few years in a pot. When they get to this stage, they should be de-potted, divided and replanted in completely new soil. If you really want to keep peonies in pots, we recommend you choose tree peonies, which generally undergo slower growth and have less extensive rootage. In the pots, one should use a mixture composed of 45% vegetable garden soil or fertile garden soil containing a little clay, 40% neutral universal soil, 10% sand and 5% dehydrated manure. At the bottom of the pot, it may be useful to put a layer, about 5cm in thickness, of LECA (light expanded clay aggregate) or coarse gravel. One is also advised never to use a plant pot saucer. Peonies need the winter cold, and therefore should not be placed next to the perimeter walls of houses or placed under roofing which provides excessive shelter. The height and diameter of the pots must be appropriate to the size of the plant. 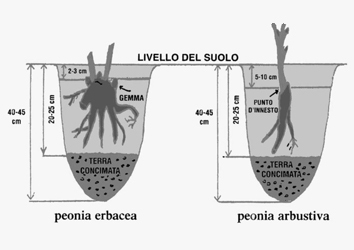 To this end, one must bear in mind that, for tree peonies, the graft must be around 6-8cm under the surface and that the roots of a cultivated plant in open soil reach a diameter 1/3 greater than that of the projection of the leafage above the ground. As an indication, a three to four-year-old plant should require a pot of 28-30 cm in diameter and about the same in height. Subsequently, the size of the pot should be progressively increased in line with the growth of the plant. Intersectional hybrids have proved to be quite suitable for growing in pots, while herbaceous hybrids are perhaps less so. Potted peonies require greater fertilisation with respect to those in open soil and one should be very careful with watering, as if this is done too often, especially in the winter, it can lead to the roots rotting which consequently causes the plant to whither and die. As far as exposure and other growing conditions are concerned, they are practically identical to those for plants grown in open soil. 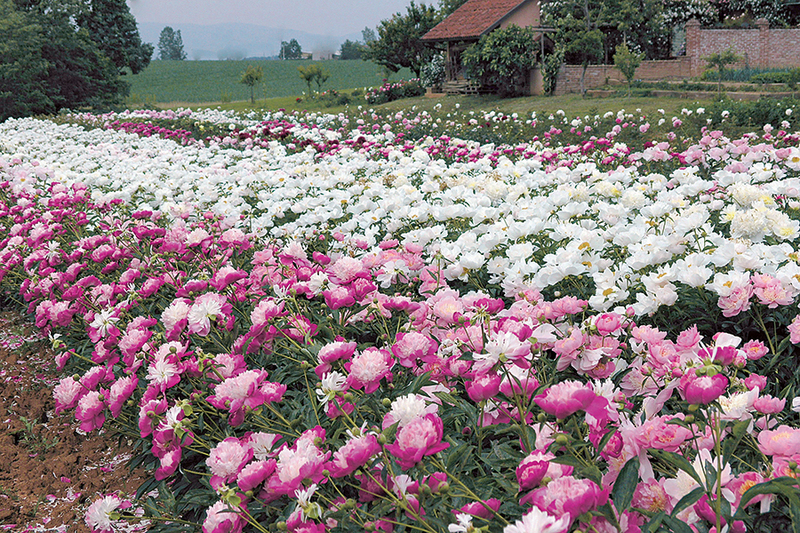 Production of peonies usually happens by vegetative reproduction for both herbaceous and tree peonies. Propagation of tree peonies is usually done by side or central split grafting on the roots of the Paeonia lactiflora variety. Grafting is done at the work bench using tree peony branches produced by the plant the same year but already lignified. Once made the grafting is bedded for one or two years on substrates of varied composition. Division is another propagation method which can be applied to both tree and herbaceous peonies; in this case the root system must be unearthed during the fall, washed well with a water jet and dissected with a blade making sure each new plant has 3-4 buds for herbaceous peonies and 1-2 stems for tree ones, with some root portions 15-20 cm long. Also sowing is a valid method to reproduce both herbaceous and tree peonies; however, it must be kept in mind that the features of the new plant could be different from the ones of the plant from which seeds were collected. Reproducing peonies from seeds is a very long process (the germination of the seed alone can take two years) but is the only way to obtain new varieties. Generally 7-8 years are necessary to see a plant sprouted from a seed go into bloom. Whoever plants a peony, doesn't plant it for himself, but for his children and his children's children. It is helpful to remove withered flowers from young plants to prevent them from spending energy making seeds; if flowers are cut off to make compositions, one or two leaves at the base of each stem should always be left to avoid compromising the vegetative cycle of the plant; it is good practice not to cut more than half the stems from each plant. In any case it is not advisable to cut flowers with long stems from plants bedded during the previous fall. To reduce the infective sources of fungal diseases it is advisable, in autumn, to cut the stems a few centimeters above the ground and destroy any residue. The most common diseases affecting peonies are Botrytis, which produces dry spots on the leaves or rotten areas covered with gray mould at the base of the stems or on the buds, and Cladosporium which attacks leaves and stems late in the season and produces small round reddish spots. Both diseases are promoted by excess humidity both in the soil and in the atmosphere. To limit damage it is advisable not to exceed with nitrogenous fertilizers, and irrigation. In particularly humid years it is often necessary to treat the plants with anti-Botrytis products (Ronilan, Rovral, Sumiscelex). The most destructive organisms are certainly nematodes. These little worms, invisible to the naked eye, install themselves in the thinner roots, causing tubercles and round malformations termed galls; their attack leads to rapid deterioration and death of the plant, unfortunately with no possibility of curing. 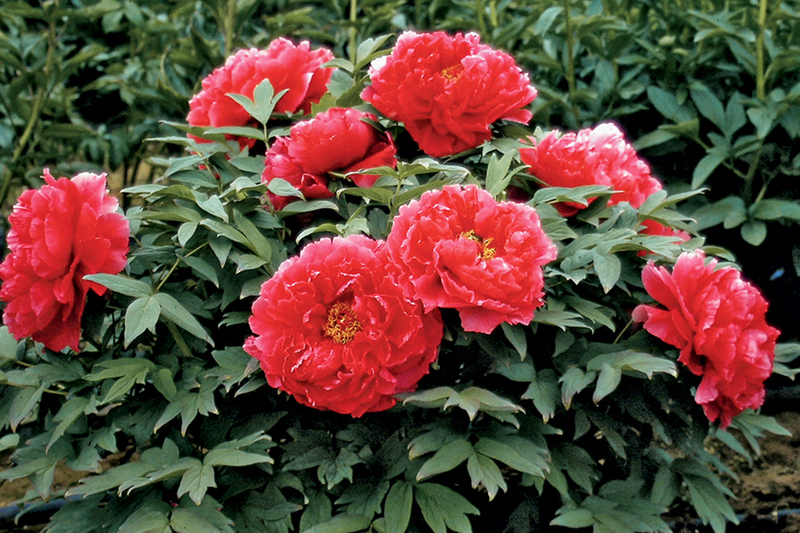 If a plant has been attacked by nematodes it must be eradicated to avoid the propagation of the disease, and peonies cannot be planted in the same soil for many years; luckily nematode attacks are very rare. If peonies are kept in constant excess humidity, pathogenic organism causing rot are likely to attack their roots; the level of seriousness of these attacks depends on the pathogenic organism and the condition of the soil. These attacks should always be avoided, since plants attacked by severe forms usually waste away and die within a few seasons. To divide a plant which becomes very large, it is necessary to keep in mind that sometimes the plant will not bloom the year after transplantation. 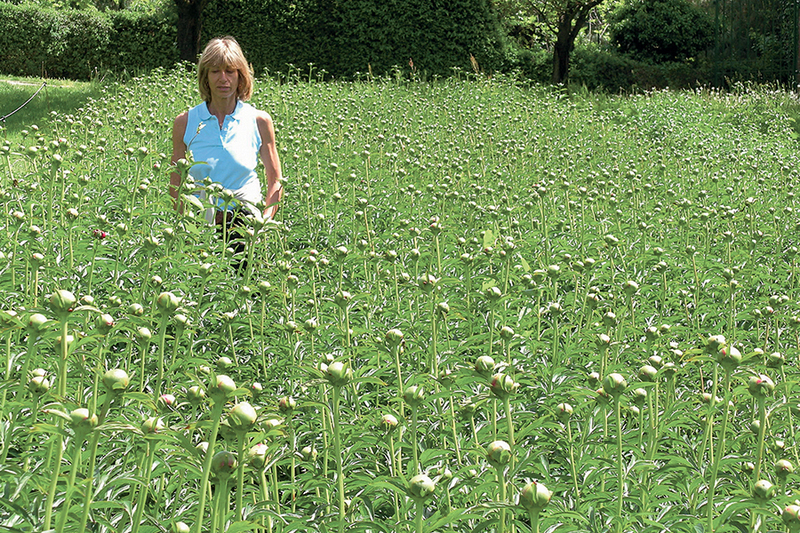 It is never advisable to replant peonies in a place where they have lived for a long time. In this case it is advisable to wait at least 3 or 4 years, during which it will be necessary to disinfect the soil and provide it with plenty of organic manure. Also tree peonies are attacked by Botrytis, Cladosporium and nematodes: precautions and care are the same as for herbaceous peonies. Good prevention can be achieved for tree peonies by sprinkling them with cupric products at the end of the winter, after having eliminated dead branches and cleaned the plant. Also for tree plants, and especially for young ones, it is advisable to cut withered flowers to prevent the plant from wasting energy in making seeds. For Lutea hybrids, which are practically sterile, this practice is not justified and can be skipped without problems. Tree peonies do not require any special pruning; at the end of winter it is always advisable to clean the plant, removing all dead and weak branches and branches too close to each other, thus favoring good ventilation inside the foliage. Sometimes, especially when peonies have been planted with a grafting point too superficial, they tend not to branch from the base of the stem as they should. In such cases, when plants grow on one or two branches only, long and bare at the base, a shaping pruning might be advisable. It should be done between the end of October and December, by shortening the branches to about one third of their height, to favor the sprouting of several branches from the buds at the base of the trunk. These rather drastic interventions are usually more effective if combined with mounding soil at the base of the plant. In normal conditions tree peonies do not require much water. Their vegetation stops rather early in the summer, and it is possible for leaves to be partially dried already in mid September, especially for plants exposed to full sunlight. 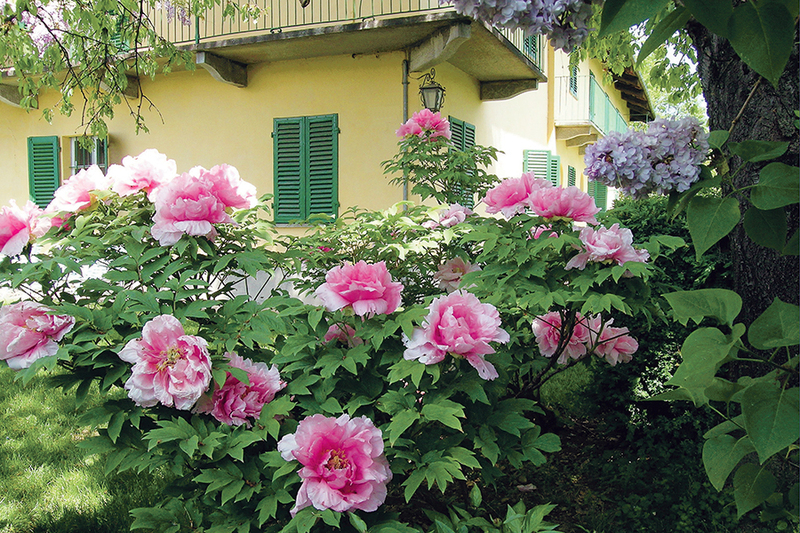 Peonies are most sensitive to lack of water during the blooming period: it is necessary to take special care to watering them in this period, especially when the spring was particularly dry. As in the case of herbaceous peonies, excessive water is much more dangerous than lack of water; adult plants can easily survive lack of water but waste away and die if the soil is constantly soaked and asphyxial. Among tree peonies, Lutea hybrids have later vegetation than varieties of the Moutan group. Among herbaceous peonies, hybrids and botanical species are instead earlier than current garden varieties of Paeonia lactiflora. Usually the plants require two or three years before developing normally, and thus can give the impression of producing few flowers or sometimes not blooming at all. Being among the earliest flowers, peonies also stop vegetating early, and thus can have an autumnal appearance already in mid-September. To ensure long life to cut flowers, it is advisable to cut the branches when the buds start to soften and allow the color of the flower to be only glimpsed. If branches with fully developed flowers are cut, they will last a shorter time.